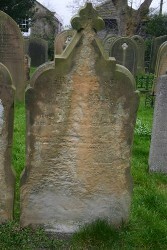 Like wind erosion, water erosion of gravestone monuments is often a very gradual process and is often greatly influenced by the type of stone and its position relative to the prevailing wind. The most likely type of stone to suffer water erosion are those made from sandstone. Other much harder stones such as granite and slate are the least effected by water erosion.